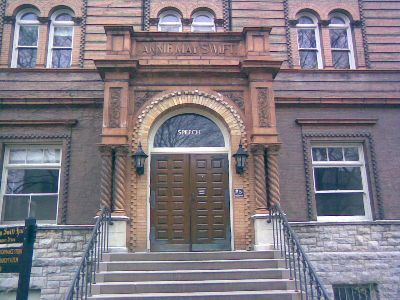 WNUR officially began broadcasting from Annie Mae Swift Hall May 5, 1950, and has remained there until now, first in the basement then, since 1995, in the McCoy Foundation Studios behind the auditorium on the first floor. The old basement studio was pretty much the quintessential college radio station: almost entirely unsuitable space, nailed together two-by-fours for record shelving, ancient, flakey equipment and so on. I remember doing an interview with McCoy Tyner where we all had to huddle round a single microphone balanced on a chair, because we only had one working microphone at the time, and the way it was connected precluded using a normal stand. CDs were just becoming common when I started at the station, but we didn’t have anywhere secure to keep them, so they lived in someone’s dorm room and you had to make arrangements to go and get them the day before your show. Anything we recorded was on reel-to-reel tape and pre-recored announcements were on cartridges (physically the same as 8-track, but with specially recorded tones to cue and auto-stop)… Those were the days! In the early nineties, after I had already been at the station for a few years, the McCoy Foundation gave the university some money to improve the facilities and new studios were built in a space that the station was using mostly for storage. The new facilities were a huge step up, both physically as the space was actually suitable for its use and included a small performance studio and news/interview studio, and in terms of the equipment. Proper storage for the record and CD collection (no more two-by-fours) was close at hand. It has been a nice place to operate from for the last dozen years. Studio equipment has changed hugely over the last decade, with everything going fully digital. 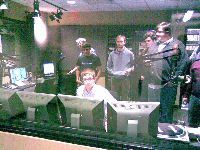 The new studio should be a great place, especially for the core of the station, the students, who need exposure to how things are done out in the real world. As for me, there will be fewer buttons to push, but now each of them does about 20 things so I should still be able to push the wrong one often enough to keep you all guessing. They kindly asked me, as probably the longest continuously serving WNUR DJ still around, to come in and play the final recording and sign the old studio off the air for the last time. So after after almost 57 years in Annie Mae Swift I took the station of the air at 5:00 pm CDT March 27. 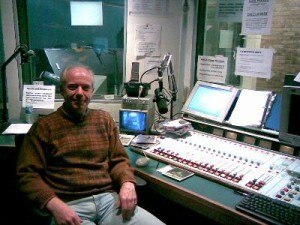 About 21 hours later the youngest freshman DJ brought the station back on the air from its new location. This entry was posted in History by Flavian. Bookmark the permalink.